Next Thursday we will have our parent/teacher conferences. If you have not done so, please sign up for a time to meet with your child’s teacher. During this time there will be representatives from the Daughters of St. Paul in the robotics lab. They will be hosting a book fair for our school on Oct. 28 and Oct. 29. Please take time to visit the fair. A special thanks to Veronica Gregory and Ava Consiglio who held a lemonade stand. They donated the money to St. Ambrose. It is wonderful to have such great students here at St. Ambrose. Thanks to all of our families who have done a virtue circle at home. It is very important to have the school and family working together. Thank you for your continued efforts. Outside the gym at the top of the stairs there is a table with sign up sheets for the parent/teacher conferences. Please sign up for a time to meet with your child’s teacher if he/she is in grades PK-5. If you are unable to make it into school to sign up because of your work schedule, Fast Direct your child’s teacher a couple of times you are available and she will check the list for you. If you have a middle school child, middle school teachers will be in the gym as in the past. There is no sign up sheet for middle school. Middle School students are also expected to come to the conference with you. Conferences will be on Oct. 29 between 1 and 9 PM. First quarter awards will be presented after the 8 am Mass on Tuesday, November 3rd. The clothing drive is THIS WEEK, October 19-22nd. Please send in your clean, gently used women and children’s clothes in a large trash bag. Members of STUCO and Student Ambassadors will be in front of school during drop off time all week to collect your bags. SchoolaSticth will then pick them up and sell them on their website. We receive 40% of the sales and earned $1500 last year! PTO will be hosting Trunk or Treat on Friday, October 30th from 6:30 pm to 8:30 pm on the school parking lot. Flyers were sent out on fast direct and are also available in the office. Be sure to send your reservation in soon. Just a reminder, all PTO forms can be found on Fast Direct under the Planner tab under PTO. If you have any questions about either event or any PTO matter, please feel free to contact PTO through Fast Direct. Thanks! Registration for CYC basketball is now open for boys and girls in grades 3-8! Due to District deadlines, we have to close registration on Friday, October 23rd so please don’t delay and register today!! Once you have registered your child/children, please click the link that takes you to the payment page. Registration will remain open until Friday, October 30th. 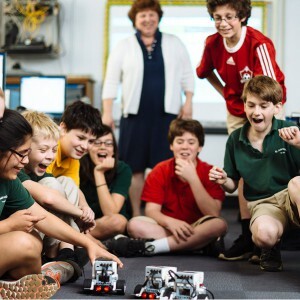 St. Ambrose School has entered into a partnership with St. Louis University High School to add robotics and coding to the curriculum. The completion of the new STEM (Science, Technology, Engineering, and Math) lab and the addition of the Robotics Lab will provide students an environment to be successful in this growing subject area. The article “Why Teach Kids to Code?” by Liane Rae in Momentum, a publication by the National Catholic Educational Association, highlights some important benefits of including coding in the curriculum. “Teaching coding in the classroom transcends conventional standards, and exercises student’s logic and creativity. Children are creators, builders, tinkerers, natural collaborators, and fearless explorers. Computer coding introduces children to a new way to create and build. Through code children can invent games, animate stories, and learn strategies for breaking down complex problems into easier to understand ideas. Children look to one another for problem solving and new ideas. The atmosphere of a class of children experimenting with computer code buzzes with creativity and excitement as groups of students work together to solve problems. The virtue selfies look fantastic! Please continue to send in your virtue selfies and stop by the office to see the Virtue Wall. First Grade students practiced irregular plural nouns while playing friendly games of Go Fish!